Grand Beauty TV is Online! New segments monthly sharing the very latest trends, tips, tricks and treatments to take care of your body, skin, hair and soul! Our Tampa Hair Salon is truly different. Our guest’s call us the best hair salon in Tampa for a reason. Tampa’s only certified balayage hair salon, with four national artists – something you won’t find anywhere else – and a team of highly trained stylists, you can be sure you’ll get a haircut and style or hair color that leaves you looking and feeling your best. Let our expertly skilled and caring spa therapist help you select the perfect treatments specific to your needs. Choose a powerful massage that releases your body’s deepest tensions or enjoy a cleansing facial that restores your skin’s natural glow. At The Grand Beauty Spa in South Tampa, you can have it all in the areas most lavish day spa and hair salon atmosphere. You’ll enjoy unparalleled luxury and relaxation where your inner essence is rediscovered. Visit and see why we are called Tampa’s Best Hair Salon and Day Spa. Get more Spaaah for your money! Select from one of our Grand Beauty Membership programs and get the beauty regimen that is right for you! This month’s Featured Product is a first of its kind! 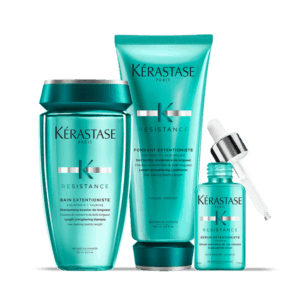 Kerastase Resistance Extentioniste. Learn more about why this product is so special here. Indulge youself. Hair Salon Artistry and luxurious spa treatments at The Grand! Check out our Special Spa Packages for the new year right here. Well don’t I just feel like a princess! I want to send a huge thank you to Philip and Russ for doing such an amazing job on my hair! They took me out of my comfort zone for the perfect new shade! Russ answered all one thousand of my questions about the products and process and truly did an amazing job! This is the most beautiful salon and spa I have seen! Such an amazing experience. I’m so grateful to have found Kirsten and The Grand Beauty Spa. The facilities were beautiful and the shampoo chairs took the experience to another level, however Kirsten’s expertise was the best part. She is a phenomenal colorist, provided me with a perfect haircut, and is one of the nicest people I’ve ever met. I’ve had massages by Kimberley and Bruce. I trust no one but Rita to work her magic with facials. Net net… I’ve always had FANTASTIC SPA SERVICES here. 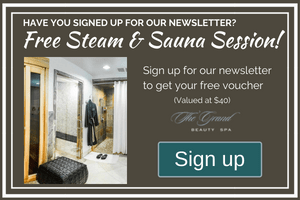 I needed a “spa day” and made an appointment at The Grand. The minute I walked into the Spa, I immediately felt at home. I was graciously greeted by Angie. I was given a tour of this fabulous serene spa. The staff here went above and beyond. I started with an amazing facial with Rita. Her hands were like feathers! Followed by Nails with Niccell, a thourough and solid manicure. Last but not least, I had a color retouch and haircut with Philip. He was absolutely amazing! Listened to my needs and offered suggestions. I highly recommend the Grand it was one of the best days I’ve had in a long time. I think the Grand’s name Is very appropriate Because you have a Grand experience. From the moment you walk in the door you were treated like royalty. The services are outstanding and technicians are compassionate and and Caring .. If you would like to have a beautiful relaxing wonderful day and come out looking phenomenal book an appointment with the Grand!!!!! I would like to thank the spa for a fabulous day of pampering for my grand spa day. I was treated like a queen as well as my friend. You are blessing. I feel relaxed thanks to Bruce and Rita. Thank you for everything.